King size bed or two single beds, ensuite bathroom & shower, under floor heating and ceiling fan. With views of the Groot Drakenstein mountains, one finds themselves surrounded by peace and beauty. King Size bed or two single beds, ensuite bathroom and shower, bathroom heater, ceiling fan, wall mounted heater, situated on the first floor. We have a wide variety of local chefs and bakers who provide us with the best local quisine available. King or twin bed, ensuite shower, bathroom heater, breakfast included. Situated on first floor with private balcony. We cater for a variety of guests from business men looking for a conference venue, to the newly engaged couple, looking for a romantic wedding venue. Our beautiful valley is known for its excellent wine and wine tours. Perfect for any couple on a romantic getaway. Very private, King or twin bed, ensuite shower, under floor heating, breakfast included. Situated on the first floor. Our peaceful valley surroundings and activities are perfect for any family looking to getaway from the hustle and bustle of the busy and chaotic city life for a brief moment. Spare us a moment of your time if you please to ask of you a question or two. Perhaps you wish to visit a place nestled among the trees in some idyllic town with spectacular views and that you have never heard the name of but you see it sometimes in your dreams. Legend has it that when winter comes without a star only a special fireplace can truly deal with the bone chilling cold and what if it is not east of the sun and west of the moon, would consider going there. Ever wanted to experience a truly peaceful valley rich culture, steeped in tradition and which prides itself on a legacy? A legacy that dates back to a more innocent time than our own where the streets are narrow and once was cobbled stone. Have you ever allowed for unpretentious beauty to move you, or to let simplistic splendor engulf you or did you ever simply surrender so the ambience of a can truly overwhelm you. Would you like to stand with yours arms akimbo when September heralds to return of Spring and with childlike anticipation watch as a valley in full bloom from orchard to wild flower from Daisy to Dahlia and all Flora in between simply let it move you. Even still perhaps you just simply love to get in touch with your own soul for a while or moment or longer so no single stimulus can escape through the dragnet of your senses ... your choice. But if you answered YES to any of the above then please do yourself a favor and consider a visit and allow us to become part of your memories and just imagine for a moment telling your grandchildren a story starting thus. "We cater for a wide varity of guests ranging from family vacations, special events such as weddings, small conferences and business events as well as anyone who is looking to just break away from the hustle and bustle of the city life to a place of harmonious peace and tranquility. Lumleys Place is perfect for any family looking for a relaxing holiday venue." Relax in one of our four-star rated bedrooms. Our sincere hospitality comes standard with each room. We hope you enjoy your stay with us. We host small conferences which seats up 35 people comfortably in lecture style or 70-80 people seated for high class meals. Nestled among the trees with spectacular views is a venue fit for any King and Queens wedding which will never be forgotten. Our flexibility is only matched by our supreme hospitality. To bring your event to life please contact us for more details. For those no nonsense quick and easy getaways we have the perfect affordable options to make the entire family smile. Lumley's Place is a family operated Bed & Breakfast and it is the brain child of a dynamic husband and wife team namely Peter and Benita Cyster. Both of them are born and bred in the town of Pniel and they both share a passion for the rich history, the friendly people and beauty and peaceful surroundings which makes one feel that for a moment you stepped into forgotten and bygone era. The name Pniel comes from The Bible, taken from Genesis 32, 30 although the name is documented as Peniel "The Face of God" and it speaks of Jacob's encounter with the angel. People here believe that to live in Pniel is like to see The Face of God every day. The rich history of the town dates back to 1843 which saw the birth of this community at the foot of Simonsberg. The Cysters' and their love for people and indeed socializing, culinary cuisine, good wine and their pride in their valley were instrumental in their decision to build Lumley's Place. It was furthermore part of their personal quest to leave a legacy by exposing others to one of the most beautiful mission communities in the world. Benita has some handy experience which stems down from generations of the family's passion for cooking for their big families. One can however not talk about Lumley's Place without talking about Lumley's Farm and that part of the farm Lumley's (Johannes Dal) plots were bought by The Lodge called P.O.S.V (Pniel Onderlinge Samewerking Vereeniging). It is on one such plot that this architectural masterpiece that would have put a smile on the face of Frank Lloyd Wright was erected. Much care was taken by the Cysters in utilizing the elevation and to create and design a structure that is not only beautiful to photograph from all angles inside or out, but also something that leaves a memorable impression on those who come through its doors as guests and visitors. This care can be seen in every bit of detail from the liberal use of glass to utilize natural light during the day and create a most spectacular effect at night to the color of the building which compliments rather than shouts. Consider for a moment interior design and decorations with its sleepers on the staircase and its pioneer styled fireplaces to its ultra modern banisters and plush duvets and textured paints with every room having a unique identity. To keep up to date with us, follow us on our Facebook and Twitter pages. "Experience a truly peaceful valley rich culture"
Choose from our four spectacularly comfortable rooms, each with their own unique touch and ammenities to suite any individuals needs. King size bed or two single beds, ensuite bathroom & shower. Under floor heating and ceiling fan. Kind size bed or 2 single beds, ensuite bathroom & shower, bathroom heater. Ceiling fan, wall mounted heater. Situated ont he first floor. "At Lumley's Place we make sure that all our guests feel at home." Take a look at a few of our best gallery photos below or click on the "view full gallery" button to see our full gallery. "Thank you so much to the Lumley's Place Team for looking after us so well! We were treated (and felt like) family, and I was sad to say goodbye. These are very special people, who also took great care of our 2 year old for us while we were at a wedding. They absolutely want their guests to have the best stay possible and work very hard at keeping their business as successful as it is. Well done and thank you once again." "Lumleys Place is like a home away from home and was perfect for our needs. Some good Cape hospitality that will warm your heart." "We loved the cozy vibe of the place. You feel at home, and in great part because of the warmth of the staff. Is is a hidden gem!" "The beautiful and spacious establishment with the home away from home feeling is unforgettable. What impressed me most was the attention to detail." "Never before have we experienced such warmth & generosity from the owners of a guesthouse. The owner has such a magnificent eye for detail." "In such a natural and beautiful valley, there is so much to do for everyone. From romantic honeymoons to family getaways, theres something for anyone. Click on the button below to see all our upcoming events!" Guests are invited to enjoy all this magnificent farm has to offer: an award winning wine and bio-friendly food experience and more. Biking tours around the Cape Winelands instead of driving from wine estate to wine estate is a healthy, fun and green option. Our beautiful culturaly rich valleys provide us with some of the best wines in the world. With many vinyards to choose from. With various kids play areas as well as catch and release fishing, Le Bonheur is suitable for the whole family. This is a great blog to kepp evereyone up to date with all the facts about whats new, in and around the Stellenbosche and Pniel area. 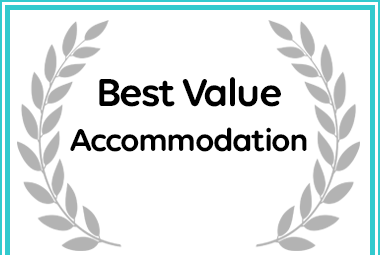 "We received an award for our excellent service"
"We have a Level 1 BBBEE Certified Rating"
Lumley's Place Bed and breakfast received a Best Value Award for Cape Town Accommodation.